Carlos Vincent is making up for lost time. Back from a shoulder injury that cost him the second half of last season, the McNary senior went 3-0 in a tournament at Silverton on Friday, Dec. 9 to improve to 6-0 on the season. His goal is to win district and then place at state, which he didn’t get an opportunity to do last year. And Vincent is off to an undefeated start while wrestling guys at least 15 pounds heavier than him. Vincent weighed in at 155 at Silverton but wrestled at 170 to fill a spot for the Celtics. Vincent started the tournament by defeating Alec Roberts of North Marion 4-3, which was much tighter than he intended. Vincent dominated his next two opponents and his 13-4 major decision was the difference in the Celtics edging Silverton 40-39 for their only team win of the day. McNary head coach Jason Ebbs hopes Vincent will be an example for the rest of his wrestlers. “I just think his mind is simply in a good place and that’s something that I think is good advice for any wrestler,” Ebbs said. “It’s easy to get caught up in the nerves and the giving up the weight but he’s just learned to step out on the mat and do his job and it’s working out well for him. He just stayed in really good position. 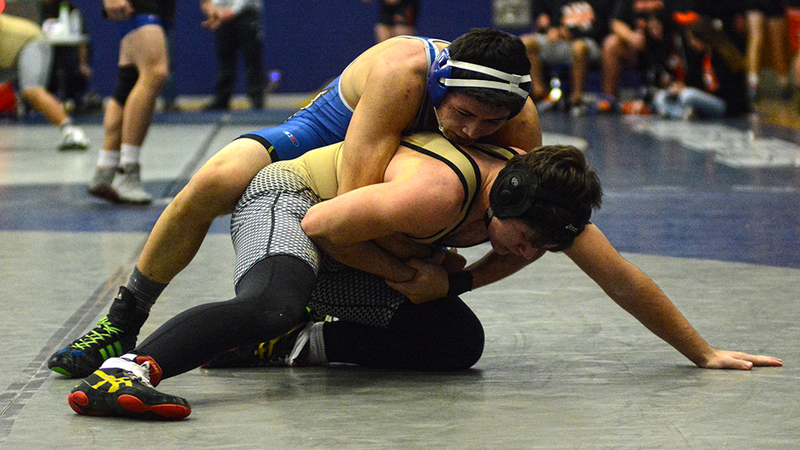 Four McNary wrestlers, Sean Burrows (132), Noah Grunberg (145), Brayden Ebbs (152) and Wyatt Kesler (160), earned pins against Silverton. Enrique Vincent (126) and Anthony Garcia Reyes (195) won by forfeit. In a 49-27 loss to North Marion, Celtics Nick Hernandez (138) and Ryan Mosgrove (120) won by pin fall. Noah Gatchet (106) and Aiden Foster (113) both won via forfeit. Brayden Ebbs, who won the 138-pound Greater Valley Conference title and placed fourth in the state last season, lost by pin fall to Lane Stigall at 152 pounds. “The guy that Brayden wrestled has already signed with Division I Missouri,” coach Ebbs said. “He’s a phenomenal wrestler. They’re a great program. They do a good job. Our job right now is maybe not be able to beat them but to get our younger kids up to speed with them so in February we can compete with that team a little better than we did that night. Celtics also came up short against Cascade, 48-27. Killian Dato (138), Burrows and Ebbs all got pins. Gatchet won by forfeit.